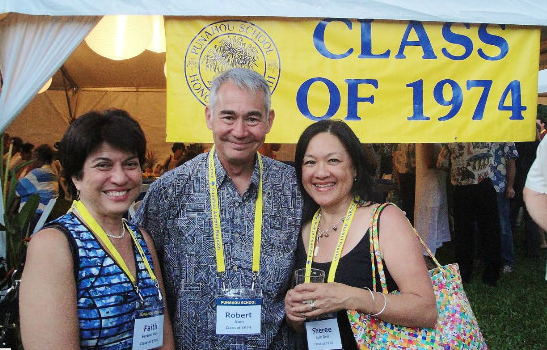 Friday night of Punahou’s Alumni Week 2014 was the night for parties, reunion class parties that is. 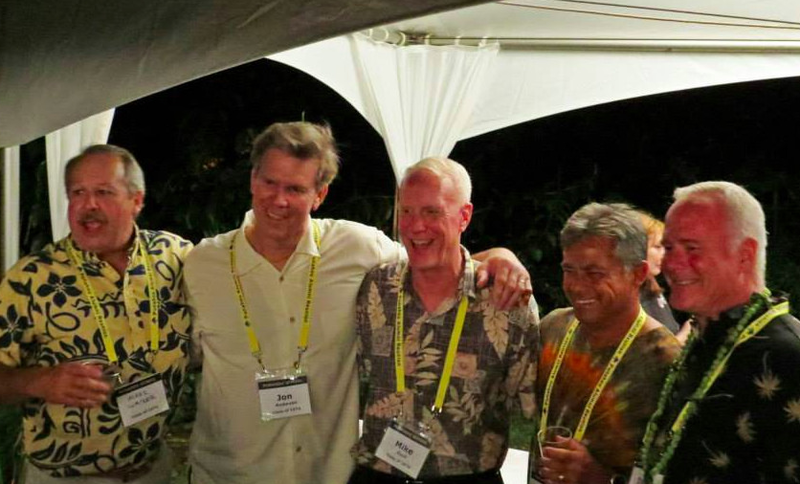 Party sites were situated throughout the city of Honolulu: Pier 39, Waialae Country Club, and Punahou74? It was headed for a little house in Nuuanu Valley. It was the best attended event of the reunion. More than 175 classmates, family, and friends came to reunite at John Morgan’s historic residence. Built in a classic colonial style and surrounded with beautifully manicured gardens, it was a gracious setting. Tents and tables had been set up for the outdoor party and our weather prayers had been answered! Despite it being Friday the 13th we had received some good luck. The temperature was a balmy 84 degrees and the sky cloudless as with soft trades blowing through the grounds. Scott Metcalf placed signs alongside the road directing the party-goers to the site. Upon arrival Dave Chin (Pauline Chang Chin’s husband) and Stein Rafto (Haven Young Rafto’s husband) got the dozens and dozens of cars properly parked on the big lawn. Stephanie Chin (Pauline’s daughter) and Terry Ting ’71 checked in the classmates. Punahou74 logo shirts and other merchandise were available at the table for pick up as well as the all important NAME TAGs. 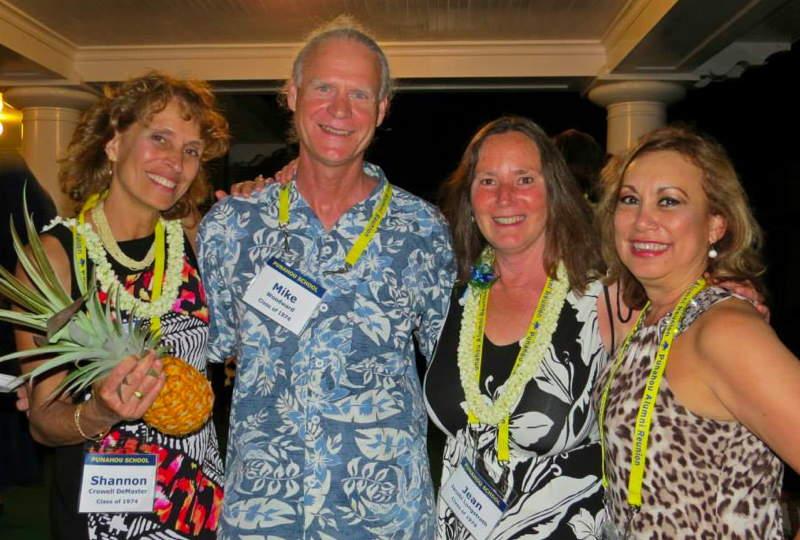 Scott Metcalf, Yuriko Wellington, Mary Jane Markoskie, and Gigi Dennis Ewing had done a wonderful job of putting these together. Thankfully, the names were printed in BIG letters to minimize the embarrassment factor when meeting up. The event opened with a memorial service recognizing our departed classmates that Mary Jane Markoskie, Heidi Hemmings Hall, and Cathy Kam Ho had assembled. It was a sober reminder of the passage of time. There are too many names on the list; too many added since our 35th reunion. But the night was meant for the living and it was time for the fun to begin. John Morgan opened the evening by welcoming everyone to his home. All were graciously invited to also enjoy the home’s interior. John’s wife Carri also spoke and said that she and her mother-in-law were wowed by Babs’ Miyano Young’s floral arrangements. No wonder. We all were. After a prayer from Ralph Aona, the food was served. It was time to enjoy catered specialties from Elmer’s Island Cuisine/Poke Stop as well as the culinary creations of Fred Hu, Pauline Chang Chin, and Lynette Lo Kanda. Drinks were poured by The Wine Stop. A big dessert table was filled with donations from Leslie Ching Allen, Lisa Yamaguchi Bowden, Pauline Chang Chin, Lynette Lo Kanda, Gaye Miyasaki, Faith Sereno Rex, Taren Taguchi, and Ann Yoshida. There was also a big Punahou74 sheet cake. It was a party, after all. What’s better than cake to celebrate? Of course there was a program and this was run by David Parker and our cheerleader mikemen: Charlie Loomis, Ralph Aona, and Jay Higgins. Much of their time was spent passing door prizes that had been donated by Shannon Crowell Atkinson, Lisa Yamaguchi Bowden, Pauline Chang Chin, Fred Hu, Jean Jacobi Longstreth, Warren Loui, Scott Metcalf, Gaye Miyasaki, Sheree Lum Orsi, Debbi Nogami Oyama, David Parker, Haven Young Rafto, Lynn Sultemeier, Babs Miyano Young, and Yuriko Wellington. At one point Tom Farrell took to standing on a chair to exhort classmates to make their contribution to the reunion class gift. 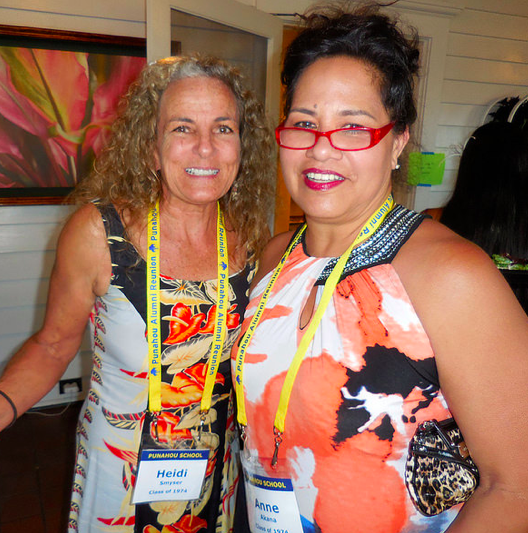 He did a good job because, when the final results came in, Punahou74 exceeded all expectations. Well, don’t we always? Throughout the evening classmates signed a Doug Young (Babs’ husband) poster for Carrie Chang Talwar. Thanks to Lynette Lo Kanda who added a Punahou74 shirt to the gift and to Yuriko Wellington who agreed to deliver both items to Carrie at her hospital in California. But all good things must come to an end and so too did the party. The ever important clean up was headed up by Pauline Chang Chin and her family as well as Susan Deto Donlon, Lynette Lo Kanda, Mary Jane Markoskie, Scott Metcalf, Lynne Gartley Meyer, Debbie Nogami Oyama, Haven Young Rafto, and Babs Miyano Young. Were we tired? Heck yes. But the reunion wasn’t over yet. More about that later. The fun was only getting started. Please click here to enjoy additional photos of the Friday party.